A few days after massive earthquake struck Nepal on 25th April 2015, I was listening to a live-calling show on Radio Nepal. It was close to midnight and the show was going in full swing with so many people calling in from different regions of Nepal. I think the show was hosted to give callers the opportunity to share information about their current conditions as well as to share what they feel about the tragedy. The announcer was also disseminating important information about the earthquake and updates from the Nepalese government. Suddenly, a male voice came on the line. “We have a caller again. ‘Hello!’” the announcer answered the telephone. “Who is this?” the announcer demanded. “I am Nandu” the caller replied. “What do you have to say about the recent tragedy?” the announcer asked him. The caller sounded emotional and began his response, “You know, Katmandu had given me everything. I had been there for decades but now it’s impossible to believe that it’s almost reduced to ruins.” “What were you doing here in Katmandu?” the announcer asked him. “I am blind and I was selling candles and other basic items but now all my hopes and dreams have been buried with the ruins of the city” the caller said. The caller continued, “With great pain, I left Katmandu at around 10 PM last night in a lorry and reached my village here at around 2 pm this afternoon. Looking at the conditions of my village and my ancestral home here in the aftermath of this massive earthquake, I am feeling sadder now!” The announcer too sounded quite emotional while the caller was sharing his experience. “Oh, I am so sorry” the announcer tried to empathize with him. Nandu continued “It’s alright, but the saddest thing was that when I left Katmandu, I was alone and I had to travel in a lorry loaded with sacks of cements. I had to sit on a sack of cement but still they charged me Rs.500, which is double the usual fare. Moreover, I overheard people in the lorry talking that it was because of people with disabilities like the blind, the earthquake happened. I am blind but definitely I didn’t cause the earthquake” the caller said in a shaky voice. I think he was fighting his tears as he was saying this. “I would like to kindly inform all that earthquake is a natural calamity and nobody is responsible for it. At this time of great national pain, we must all come together to help each other and share the pain equally, rather than blaming people like us for this inevitable disaster” he carried on. The lorry dropped Nandu at a location which was not familiar to him and he struggled for hours to catch another bus to go to his village. “Finally, I met a kind-hearted lady who helped me board the right bus that brought me home safely” he said. “So, I would like to request all drivers that if any disabled person is travelling with you, kindly leave them at a proper location so that they can get their way ahead” he pleaded. After Nandu hung up the phone, the announcer reiterated what Nandu had shared. “Nandu is blind but he has greater vision than us. What he has said is absolutely true. Disasters like earthquake are natural phenomena and nobody should be blamed for it. We must all come together in prayers and efforts to help each other at this point of time” she said. I was really moved by Nandu’s experience. I am so sad that there are people in Nepal even today who still believe in such superstitious things. I felt grateful for being born in Bhutan, where people are at least more civilized when it comes to such superstitious beliefs. It’s very sad that such a tragic incident has happened in Nepal and as a close neighbor, we also share the pain and sentiments of all Nepalese people at this crucial time. It’s great that Bhutan has been able to support a lot of victims in Nepal since our teams comprising doctors and DeSuups (Guardians of Peace) were deployed under the direct command of His Majesty the King on 27th April 2015. 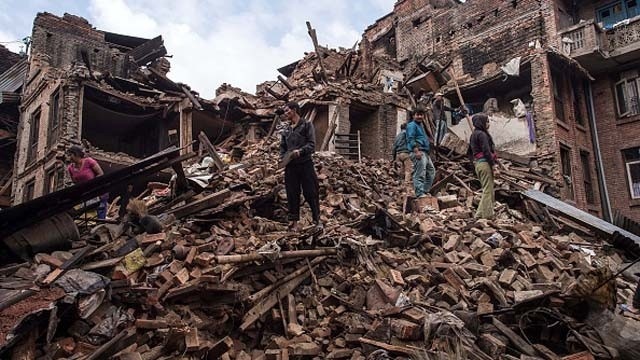 According to the updates on the national newspaper Kuensel, the Bhutanese teams have been distributing mineral-water, cloths and other relief services in addition to treating patients. Another good news is that Bhutan has sent 15 more members recently which have taken the total number of Bhutanese relief workers in Nepal up to 78. With the support and generosity of teams from all over the world, I am hopeful that Nepal would soon return to normal situation and the survivors would regain their confidence to live a normal life. God bless all! Really when will we overcome prejudice and its heartbreaking to know about the incident. I agree that we do not have such BLUNT people in Bhutan to blame the disabled for any natural disasters. It is because we do not depend on religious interpretations for our practical living. Hi Paul, I am very thankful to you for this nice encouragement. Please do come back for more such stories. Thanks for your nice account of this saddening but hopeful tale. However, as a small side remark, I remember that in the days after the earthquake there were many, many remarks in the social media from what you term as 'civilized' Bhutanese not adhering to 'superstitious' beliefs, including members of the 'compassionate' Buddhist clergy, who were bluntly saying that Nepal's earthquake occurring in the middle hills and Himalayan regions of Central Nepal, killing many practicing Buddhists, was caused directly by the mass-slaughter of animals by mainly Indian Hindus at the Gadhimai festival in the tarai last year, and the slaughter of animals for food in general. I don't see much difference with some people blaming physically disabled people, menstruating women, albino's, gays, or whoever is (temporarily) different from what they consider 'normal' for a natural disaster. I know the people who made these remarks do not constitute the majority of the Bhutanese, but I am also aware that the influence of the clergy (remember the Central Monastic Body also made the direct link between slaughter and natural disaster) can be far-reaching. There is no room for complacency in Bhutan as far as silently accepting counter-intuitive and counter-scientific arguments is concerned. They seem to forget that until two decades ago, many Bhutanese believed that sacrificing an animal to the local deities would prevent natural disaster from happening. Although this has now been stopped almost everywhere, the same Buddhists who stopped this have now taken a 180 degree turn and state that the mere slaughter of animals is causing natural disaster. This is a worrying trend that should be nipped in the bud, rather than letting to evolve into a kind of Buddhist fundamentalism by a minority that affects the rights and wishes of a silent majority. Especially when that fundamentalism is not based on any solid Buddhist teachings or practices of the past. It's usual the silent onlookers in social developments that ultimately suffer the consequences of the same developments they let happen.